I like the verb ‘se détendre’ in French, which has the various translations noted above in the title. I like the idea even better: me détendre, to release, to slacken, to relax. Let go. Calm down. Have you noticed that a lot of academics do yoga? I’ve noticed. And I do yoga. A lot of yoga. Yoga is hard but relaxing: the hardest part for me is the meditation, the mindfulnes, the being-in-the-moment, the observing my thoughts without becoming attached to them. Man. I can’t do that. Ask my teacher: I couldn’t keep my eyes closed in savasana for TWO YEARS. I’m a chronic insomniac, a champion worrier. I’m a little hepped up. A lot of academics are a little hepped up. Over the course of many of my sleepless nights, I’ve given the matter some consideration. It seems to me that to think for a living–worse, to engage professionally in critical thinking–means carrying your work around with you everywhere. It’s hard to stop thinking. Or at least, to stop thinking about things that prevent you from sleeping / enjoying your leisure time / not boring your relatives with disquisitions on usage based billing and moral imperative of net neutrality. Yeesh, self, give it a break until 9am tomorrow, okay? Hence, my theory on why a lot of academics drink, quite heavily: it slows your thinking down. 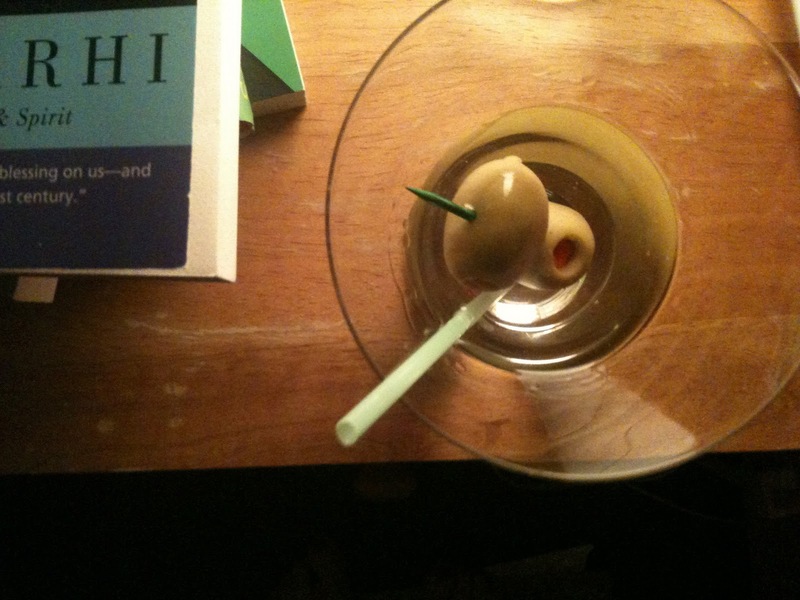 Personally, I like martinis. My husband made me this one, and he put a straw in it so I could drink it in bed, while reading a yoga philosophy book. Double calm! My other best way to calm down (when I’m not drinking or doing yoga, I guess) is comedy: I like to watch America’s Funniest Home Videos reruns every night on CMT. People falling down make me laugh, and laughing makes me calm. So none of this has much to do with who I am as an academic. But. I’m a person too, right? And it’s good to remember that, to celebrate that, in its boozy zen chuckling quirkiness. And you’re people too, outside of your academic or para-academic or post-academic or supra-academic daytime identity. So in the spirit of Friday, I ask: What do you do, when you’re not at work, to calm down, to let go, to slacken, to relax … pour te détendre? Previous Post Guest Post: ‘You, I, Me, We’: Re-Fashioning ‘Post’-Feminism? I watch TV, especially reruns of The Office, I cruise shopping/design sites (polyvore, revolve, design*sponge, poppytalk, apartment therapy, design for mankind, modcloth), or I play iPhone/iPad games. Before my son was old enough to join his sister at preschool, I used to show up early for pick-up to give him the opportunity to play and interact with the other kids so that the transition from mommy to preschool would be less traumatic. I thus became the mommy who came to play. Even though both kids are now in preschool and loving it, I've started going early again just to hang out and play with all the kids. They laugh, they talk, they share, they ask questions, they imagine, they listen, they give you hugs…Nothing makes me forget the stresses and problems of my day more than 15 2-5 year olds playing big bad wolf with me. I also try to swim. The rhythmic quality, the silence of the water, the solitude, it's heavenly for me. It's a perfect place to re-center myself. And feel like I'm actually good at something, like I'm accomplishing something. It's more solid for me than trying to figure out if my students are learning anything or if my research will amount to anything. Hey, look, I went a little faster today! Yippy! I also do yoga–lots of yoga. Specifically ashtanga. I find the difficulty of the practice focuses my mind and tires my body so that I can be more still. I also reread favourite novels, kind of like Heather watching reruns. Currently I'm rereading Robertson Davies's /What's Bred in the Bone/. Before that I reread Eden Robinson's /Monkey Beach/. And I *love* mysteries, be they on television or print: I've just watched the BBC adaptation of the Wollander series. Heather: ANGRY BIRDS FOR THE WIN! Broooo-kee! (My daughter says, “It's not called angry birds, Mom, this game is called 'Knock Down Piggy Fort'”. Right. Erin: I do Anusara. I like the aggressively finicky emphasis on microadjustments to find perfect alignment. Trying to activate my pinky toe on my standing leg occupies 100% of my available brain power. Ahhh. And my biggest outlet is making things. sewing, knitting, baking, collage – doesn't matter. If my hands are busy then my brain is happy. Cross stitch. World of Warcraft. Silly TV. Scrabble. Baking. Walking the dogs. There's a certain academic mindset, especially in non-laboratory fields, that suggests you should be productive in research/writing every waking minute of the day you're not in the classroom. That's crazy: taking a break always improves your work by giving you time to build a fresh perspective. @maepress: I just took a peep at your lovely blog… your made things are *SO* gorgeous!! I'm inspired! “I love the Wallander series too, as well as the new Sherlock series. Reading a book that is engrossing is a great way to zone out, though paradoxically, I tend to think about the book all day, and want to return to it. One could argue that these thoughts keep other worrisome thoughts at bay though, and thus it's a good trade. 2. hang out with my partner (usually involves tv, food and wine). 4. Build a fire in my fireplace, mine the contents of my PVR and chill right out. 5. Go play poker at my local casino. This is a fantastic post! And a fantastic verb. As a student I used knitting as a relaxing thing, but then after a series of jobhunting failures it became my profession. It's awfully strange to not be able to relax into your hobby because it's not your hobby anymore (besides which knitting for 8 hours and then kicking back and relaxing with more knitting in the evening is a recipe for ruined wrists). I have recently taken up quilting, which engages the same parts of me and has the same joyful results that knitting did/does without being Work. Comedy too (I am a fan of the show Community). I enjoy weekly drinks with my female colleagues (temporarily suspended while I am away). Lots of TV and movies, which helps the reading brain turn off. Cooking! Playing scrabble on the iPad or over FB. Only now doing some yoga again and also power walking (miss my pals with whom I walk–oh, and with whom I drink). Read mysteries. I think English academics are particularly drawn to mysteries, as we are suckers for good plotting. Love this post! Always good to remember and honour the other parts of ourselves. Knitting! Poker! WoW! Mystery novels! Scrabble! Swimming! Running! Fire-making! Baking! I have a lot more ideas now of how to relax. And, Maepress, I think my next blog is going to have to be called Booze Drinking Yogi. LOVE IT. I love yoga and pilates and I do three classes a week, which is great to alleviate my laptop hunch, but I also find crafting and baking to be incredibly relaxing. I'm not a sweets person at all, but I LOVE to bake and I find the process very calming and centering. I also love to sew and have been making a menagerie of tiny stuffed monsters for my new nephew lately. Starting around October I start making my own Christmas cards, which I find is a great break from studying, as it is engaging and stimulating, but not tiresome.